The IET Code of Practice recommends that PAT test instruments are calibrated annually. Manufacturer Calibration - Most PAT tester manufacturers offer a courier pick-up and drop-off service. This is usually the most expensive option, but advisable if your tester is still within an extended warranty period. Specialist Calibration Companies - There are a number of independent companies that offer a similar pick-up and drop-off service. This is usually cheaper than calibration by the manufacturer, however check first if you need any calibration warning screens resetting. Non authorised calibration may also invalidate any extended warranty on your tester. Onsite Calibration - A well respected company that can carry out calibration at your site at a reasonable price is On Site Calibration Services. 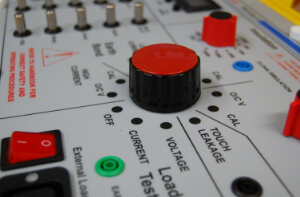 This is particularly useful if you want to minimise the downtime of your test instrument. Wholesalers Calibration Days - Some electrical wholesalers offer regular calibration days where you can take your tester for calibration the same day. These events are often run by the test equipment manufacturers such as Metrel, Megger, & Seaward, but check first if you need a nag screen resetting, as this may depend on what company is carrying out the calibration. This usually works out the cheapest option, as well as minimising the downtime of your tester. As well as annual calibration, it is also advisable to regularly check the accuracy of your tester. There are a few methods of doing this. Some test instruments such as the Metrel GammaPat, have inbuilt checkboxes. Alternatively you can purchase a separate checkbox, or you can make your own as described in a previous article here. But probably the easiest and cheapest method is to use an appliance. To do this simply designate a class 1 appliance as a reference and clearly mark the point where you attach the test lead. Test and record the readings for this appliance and then use the same appliance and test point for each subsequent check. The readings should not change by more than ±5%. Checking the accuracy of your test instrument is recommended by the IET Code of Practice and a recorded monthly check is a requirement of NICEIC membership. In the same way as a new car does not require an MOT, new test equipment does not require calibration when first purchased. All of the main test equipment manufactures include a declaration / certificate of conformity to indicate the instrument has passed quality control, testing, and calibration during production to ensure it meets their specifications. Generally new equipment should be calibrated 12 months after it is first used. Similar to a car service light, some PAT testers show a warning message if the calibration period has passed. This ‘nag screen’ is usually only on the downloadable types of tester and can only be re-set by the manufacturer or authorised calibration company. This is obviously an attempt to lock the purchaser into their calibration service, but it doesn’t affect the operation should you choose to ignore the warning and have your tester calibrated elsewhere.